Night Fighter Control for (D-Day) Operation Overlord. The final GCI system comprised 27 heavy vehicles including 3 ton Crosley, Thornycroft, and Austin heavy haulage vehicles and a Jeep. These comprised the radars, the command and control vehicles, the operations room, the diesel generators and support vehicles. All this had to be loaded onto five Landing Craft Tank (LCT) for landing on the beaches. 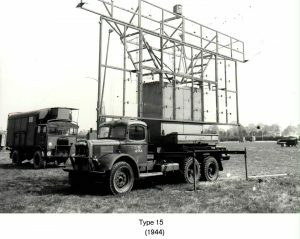 TRE decided that the two mobile Radar Convoys to be landed on D Day should be accompanied by TRE personnel in case of any major problems. 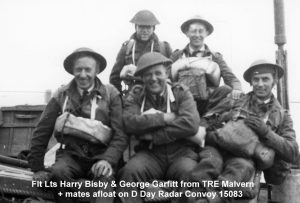 They chose Harry Bisby (Junior Scientific Officer), who had been sorting out radar problems in the Middle East and had experience of taking the AMES Type 8, a predecessor to the Type 25, onto the beaches during the invasion of Sicily. In Group 40 at TRE, George Garfitt (Technical Officer AIII), who was an expert in aerial impedance measurement and David Elias (Flying Officer), whose job was to liaise with TRE, were also selected. The fact that George Garfitt was divorced may have influenced his selection. Bisby and Garfitt were given the rank of RAF Flight lieutenant because if they had retained their civilian status and been captured they could have been shot as spies. 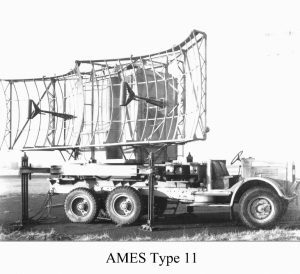 The AMES 25 system was made up of a number of radars developed at Malvern. 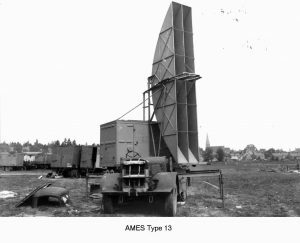 The long range Type 15, the Type 11 radar known as the “German radar” and was designed by TRE after recovering parts of a German Wurzburg during the successful Bruneval commando raid. When Mobile GCI 15082 convoy first tried to land at around noon, they encountered very heavy German machine gun fire and they could see that the US troops had not moved off the beach so they withdrew and tried again around five in the afternoon. As they came off the LCT, the water was too deep and most of their vehicles drowned. 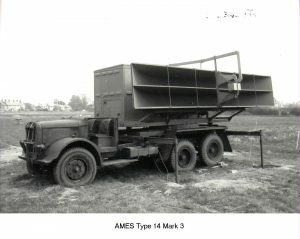 However, the AMES Type 15 set up arrived safely on the beach, including the aerial transmitter, two diesels, a crane, the radio communications R/T, one jeep and four Crossleys. The other units drowned, with the men clambering out and swimming ashore. The Type 13 disappeared into a deep hole and was never seen again and the Type 11 had to be blown up as it was a danger to navigation. They did manage to rescue the Type 14 the next day. Further landings had already been abandoned and the beach was being carefully and systematically shelled square by square by the Germans. The fire was accurate and intelligent as soon as they had hit a vehicle and set it ablaze, they moved on to the next. 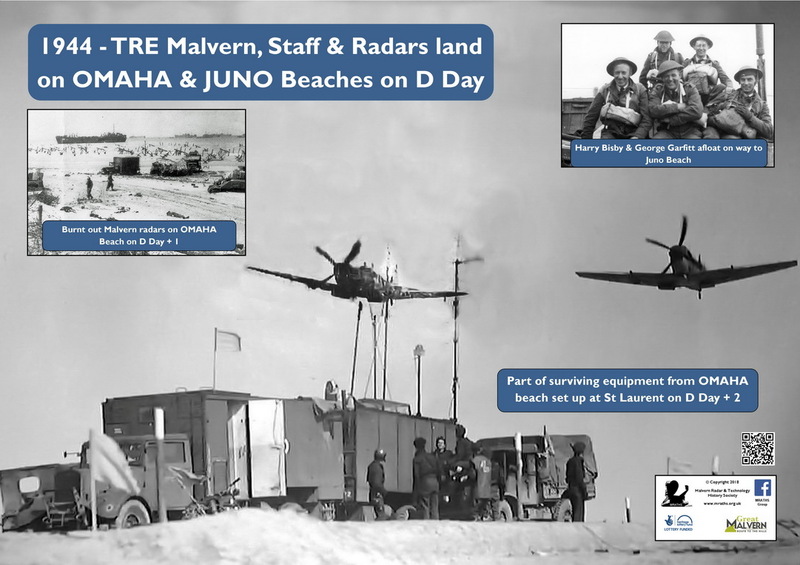 The beach was not a healthy place and the RAF’s immediate concern was to get off it and into the shelter of the little ravine that led away through the cliffs inland. The ravine was the only way out of the beach, and it had not been cleared. 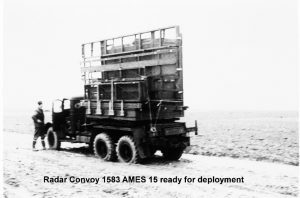 The AMES Type 15 convoy was in line and good order right in front of the ravine blocked by the earth barrier, and American vehicles, many of them blazing, blocked them on both sides. No one could get away until the AMES vehicles did, and the tide was coming in. When it was fully up, only a few yards of shingle would remain dry, and the Germans were still shelling. The Wing Commander had been hit in the arm and leg, and others had been killed or wounded. 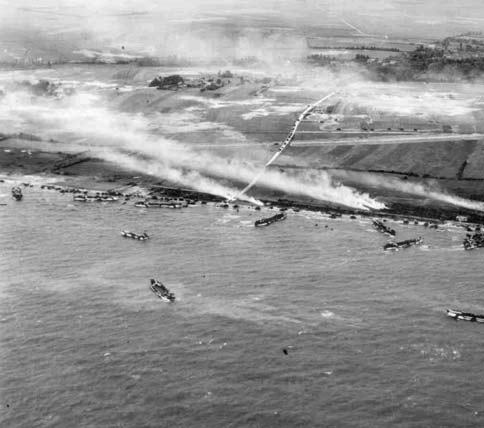 The RAF Medical Officer and one Medical Orderly were the only medics on the beach – the US medical support had been wiped out and reserves had not been able to land. So together with the Padre, they provided as much help as possible to the wounded US and RAF troops. At last they found a working bulldozer with a driver, and got him up to the ravine. Here he bit into our earth barrier as nonchalantly as only a bulldozer can, and in a matter of minutes we were free and on the move. They got the six serviceable vehicles off and up the valley into the quiet and comparative safety of a deserted village St Laurent. Here they made an emergency casualty clearing station, and for the rest of the evening and most of the night went backwards and forwards to the beach collecting wounded. They had lost 12 men dead and 40 seriously injured. 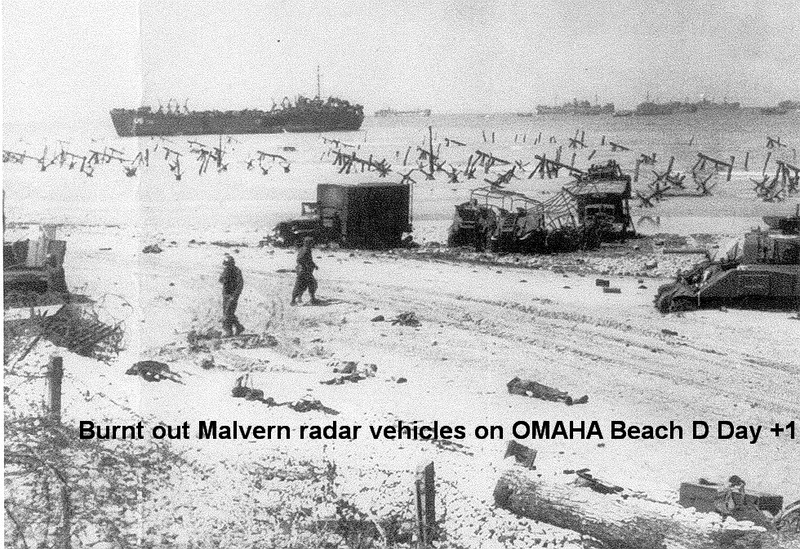 The Americans had suffered terribly and the beach, as night drew on, was strewn with dead so thick that it was impossible to move a vehicle without crushing bodies. Thousands of US troops landed altogether on Omaha Red, and of that number over half became casualties. D Day +1. They met another problem the next day as some high up RAF HQ desk bound officer had decided that all personnel should go ashore in RAF Blues. Most of the American solders had never seen an RAF uniform and after immersion in water, sand and mud, it appeared like German grey. They were then shot at by their own side and a couple were arrested by the Americans. It was not until much later that the US Rangers managed to find them old Khaki jackets, which enable them to blend in with the American troops as long as they did not open their mouths. There were still snipers everywhere and they had no food, and water was only for the wounded, but they managed to salvage more vehicles from the beach including the Type 14. D Day+2 An American General was very keen that they got on the air as soon as possible and had found them a flat field nearby, as their proper site was still in German hands. They didn’t know whether the site was mined so drove a 3 ton Crossley backwards and forwards. Having not been blown up, they drove the other vehicles into the field and set up as best they could. The vehicles and gear was full of shrapnel holes but they started to get it together making forays to the beach to try and rescue some of the technical bits and pieces needed. D Day +3. After further ‘friggery’ they got it all going and at 2200 hrs they were on the air. D Day +4. They moved to their proper site and by lunchtime the convoy was being set up and during that night shot down 2 hostile aircraft. The first GCI controlled interception from the American beachhead. The final total of casualties was six officers and 41 airmen. The men of the radar units received six Military Crosses and two Military Medals. This Convoy has an easier time landing. 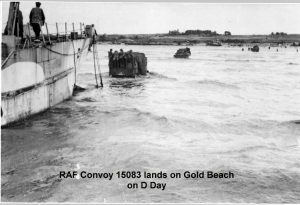 The convoy of 27 heavy vehicles came off the LTC’s without too much difficulty wading through the shallow water as the beach was being cleaned up of the dead and wounded. It was around 15.30 hrs that they reported to the Beach master. They then came under attack by a strafing enemy aircraft. Fortunately Harry Bisby was in the shelter of a truck so was unharmed. One of the trucks was hit but it wasn’t an equipment truck so they towed it out of the water and left it behind for recovery later. They had a problem immediately after leaving the beach when they met a long convoy of ambulances and other RAMC vehicles coming back from the front with the first casualties. Then they started up the lanes through two villages, Ver-sur-Mer and Meuvaines, to their site which proved perfect in every way except two. First, there were tanks in it facing in two directions ready to deal with an expected German counter attack as the enemy was “just over there” and second the grass was very long. This was a problem as during the deployment the site would be covered by cables. They managed using schoolboy French to get the farmer to cut the grass and started to set the system up. As the station began to take shape, it came to a tricky piece of lifting and fitting the AMES 15 aerial into place, a Wing Commander interfered and demanded to know why some men were waiting and not doing anything. Ft Lt Geoff Harpur. 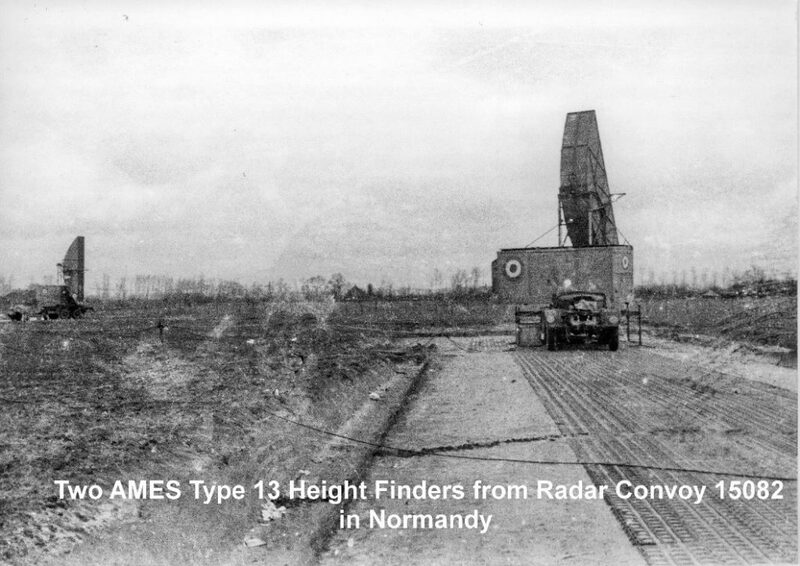 a Royal Canadian Air Force Radar Officer, tried to explain that their written orders at that point provided for eight men to lift an aerial into position and that if they were ordered over to something else the continuity of our assembly would be broken and indeed the key aerial delay fell on quite deaf ears. There was an unpleasant half hour at the end of which he told the Wing Commander that he had no right to give orders to his men. By dark they had one operations room working and at 10.30pm they took control of their first night fighter, a Beaufighter from Shorham, but with faults still on the other aerials or sets. That night they had shot down 8 aircraft. Both Bisby and Garffit couldn’t believe their luck not a scratch after the most momentous day and certainly the longest. 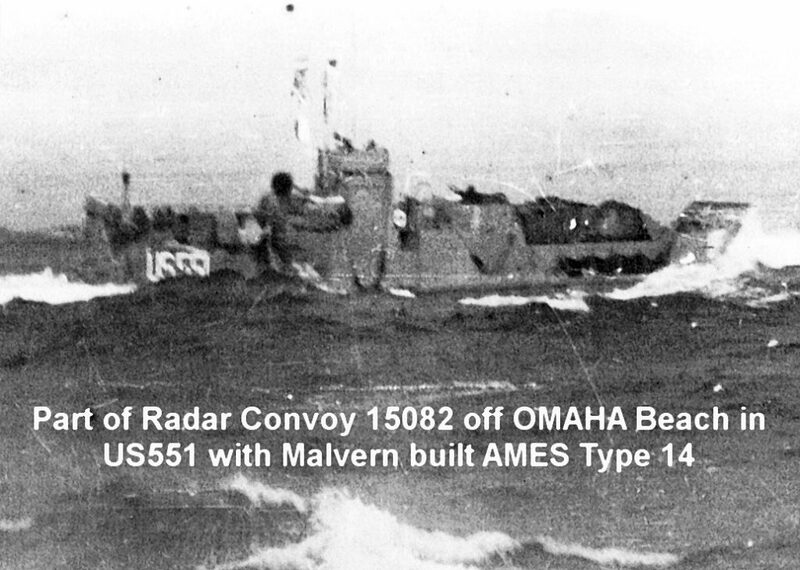 They wondered how the other GCI with the Yanks on OMAHA were fairing as they couldn’t “see” their transmissions on our receivers and they failed to contact them on the RT. 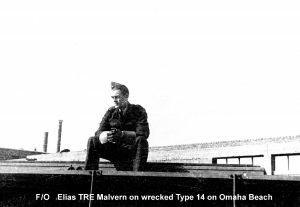 David Elias turned up safe four days later and told them that they had met considerable resistance and had landed on a false beach so that nearly all the vehicles had been swamped trying to get out of the deep water and on to the true beach with many of the crew killed.